You might wonder what else happens around here. Perhaps you’re thinking “Surely Jeff isn’t out there just pulling weeds all the time.” Well, you’re right, though I probably should be. 75 chicks arrived this morning, much to my surprise. The hatchery said they’d send a postcard so I’d know when to expect them. I didn’t get a postcard, just a call from the post office this morning to let me know the chicks were here! One hastily erected brooder and an afternoon of coop cleaning later and all 75 birds are happy, safe, and warm. Whew! Then there’s the garden. And the patio fireplace I’m building. Dinner. But by far the most important and the most demanding of my time are my kids. They’re with me while I weed, while I cook, and while I chase the geese back into their pen. 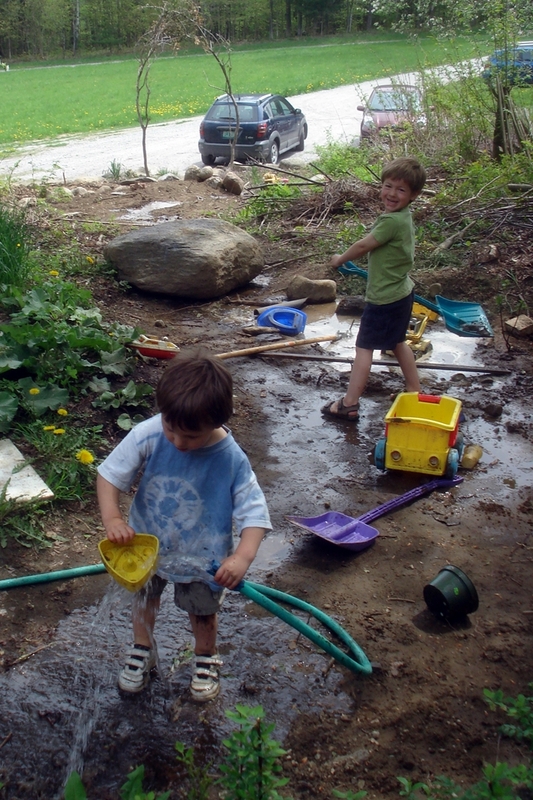 And they have projects of their own – Like flooding a hole in the ground where I dug out a rock so that they can float their boats in it and make a waterfall that flows all the way down through my garden. Ah, my busy boys. You are officially the coolest dad ever. Love you!